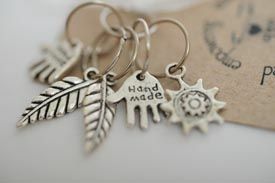 Set of 5 silver stitch markers, lovely little charms to decorate your work and help you along the way! These stitch markers are Fair Trade - produced for Injabulo by Iziko lo Lwazi, a South African womens project, with the aim of empowering women through education and employment. Fair trade stitch markers are hand-made, attractive and useful items, of benefit both to the user and the maker; they also make ideal gifts for your knitting friends! Suitable for use with knitting needles up to 7mm in size. These are split ring markers, designed to slip onto your knitting needle and slide along with your stitches. Use stitch markers to help you keep track of your knitting - to mark the beginning of a round or to remind you where pattern elements come into play, such as decreasing and stitch repeats and counting stitches. Once you have placed a marker in position, just slip it across from one needle to the other each time you meet it for as long as it is required.